We are a family run hostel on a organic vegetable farm. We are located on the south part of the Icelandic East fjords.Here you can also find Havarí café, community hall and creative center. Havarí is also the manufacturer of Bulsur, vegetarian sausages, and handcrafted chips from root vegetables and kale. You can enjoy the relaxing country life and vivid art and music scene as well as local handcrafted food in a beautiful landscape between the mountains and the sea. We are located in the Eastern part of the Icelandic fjords, around the area of Djupivogur. Our facilities are just in front of the Berufjörður fjord as well as we have several typical Icelandic towns near to our facilities such as Djupivogur, Breiðdalsvík and Stöðvarfjörður, where you will be able to discover the real scent of Iceland. We offer accommodation in dormitories, family rooms and private bedrooms. The bathrooms are shared and the atmosphere fantastic. The dorms are for four and eight people, meanwhile the double room is ideal for couples. In addition, we have several common areas in which the guests will be able to relax and chat about past experiences and future plans. During summer time we sometimes have events, mainly concerts. Follow us on facebook or instagram. This is an absolutely LOVELY hostel. So clean with a very friendly and welcoming atmosphere. I highly recommend staying here! Would give a 12/10 if I could! Beautiful hostel! Very clean, provides blanket and pillow, kitchen, not too many per room. Offers late check in. Would absolutely stay here again. Our stay was everything we expected and more. 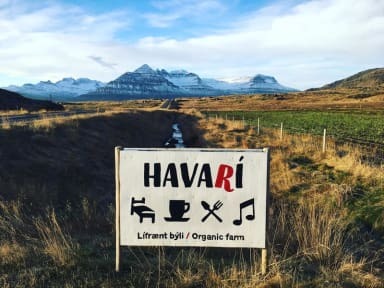 Havari is perfectly situated off the ring road but the location is still isolated/calm enough since tourists (weirdly) don't venture to the eastern fjords. The rooms were comfortable and clean. The area is beautiful and serene. We arrived on the late side so supermarkets were closed and our host invited us into his house and sold us produce to make a meal. I feel like that story says enough about their hospitality. Thanks again for everything !! This was the best hostel I’ve ever stayed in. Regally clean, comfortable beds, amazing staff and incredible location. Totally recommend if you decide to do the Iceland ring road! The staff is very welcoming, friendly, and helpful. Very clean rooms/bathrooms and the beds are comfortable. The cafe next door serves amazingly delicious food if you’re into healthy yet very satisfying grub! Location is beautiful though not near a town. Rooms and facilities were great and I enjoyed the free breakfast. Love the fact it is healthy options to eat. The staff were great. Great hostel, a little out of the way to get to! Very open and communal atmosphere. Our door didn’t have a key that we could use to lock it. They doubled charged me. And they are the worst at getting a hold of. I contacted Hostelworld.com and they told me i needed to speak with the owners of the property. They never responded to me. This has been the worst experience of my life. If you are thinking about staying at this place, please make sure they don't steal money from you.